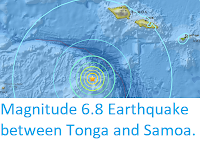 The United States Geological Survey detected a Magnitude 5.8 Earthquake at a depth of 10 km, off the west coat the island of Guadalcanal in the Solomons slightly after 5.50 am local time on Friday 30 March 2018 (slightly after 6.50 pm on Thursday 29 March, GMT).There are no reports of any damage associated with this event, but some minor damage occurred on Guadalcanal. The approximate location of the 30 March 2018 Guadacanal Earthquake. 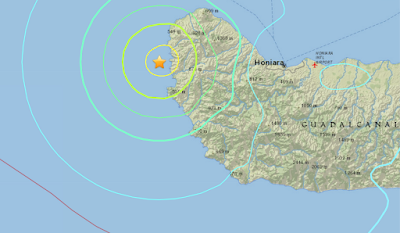 USGS. The Guadacanal Island lies on the southern part of the Pacific Plate, close to its boundary with the Australian Plate. The Australian Plate is moving northward relative to the Pacific Plate, and being subducted beneath it, along the Solomon Trench, which runs to the south of Guadacanal Island. 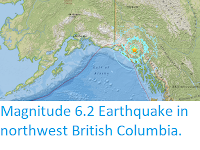 This is not a smooth process, and the two plates continuously stick together and then break apart as the pressure builds up, creating shocks which we experience as Earthquakes. 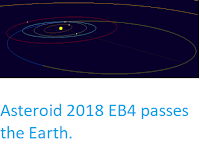 Asteroid 2018 FF3 passed by the Earth at a distance of about 435 200 km (1.13 times the average distance between the Earth and the Moon, or 0.29% of the distance between the Earth and the Sun), slightly before 3.00 am GMT on Friday 23 March 2018. 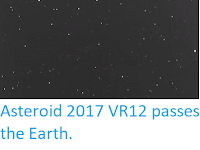 There was no danger of the asteroid hitting us, though were it to do so it would not have presented a significant threat. 2018 FF3 has an estimated equivalent diameter of 9-28 m (i.e. it is estimated that a spherical object with the same volume would be 9-28 m in diameter), and an object of this size would be expected to explode in an airburst (an explosion caused by superheating from friction with the Earth's atmosphere, which is greater than that caused by simply falling, due to the orbital momentum of the asteroid) in the atmosphere between 38 and 18 km above the ground, with only fragmentary material reaching the Earth's surface. The calculated orbit of 2018 FE3. Minor Planet Center. 2018 FF3 was discovered on 21 March 2018 (two days before its closest approach to the Earth) by the University of Arizona's Catalina Sky Survey, which is located in the Catalina Mountains north of Tucson. 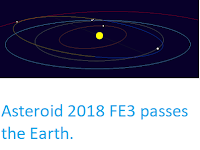 The designation 2018 FF3 implies that it was the 81st asteroid (asteroid F3) discovered in the second half of March 2018 (period 2018 F). 2018 FF3 has a 613 day orbital period and an eccentric orbit tilted at an angle of 16.6° to the plane of the Solar System, which takes it from 0.92 AU from the Sun (i.e. 92% of he average distance at which the Earth orbits the Sun) to 1.90 AU from the Sun (i.e. 190% of the average distance at which the Earth orbits the Sun, and outside the orbit of the the planet Mars). 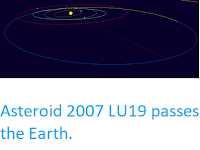 It is therefore classed as an Apollo Group Asteroid (an asteroid that is on average further from the Sun than the Earth, but which does get closer). 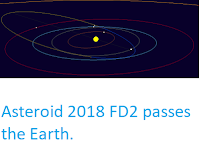 This means that 2018 FF3 has occasional close encounters with the planet Earth, with the last thought to have occurred in August 2013, and the next predicted for August this year. Listeria outbreak kills at least 189 in South Africa. 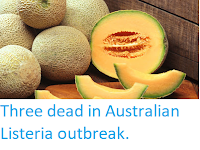 A total of 982 people have been infected with Listeria, with 189 known to have died, in an outbreak in South Africa, according to the National Institute for Communicable Diseases. The outbreak was first detected in January 2018 when children attending a daycare centre at a Johannesburg hospital began to fall ill with the sickness. 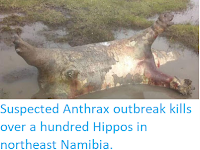 This prompted an investigation which found the Bacterium in sandwich meat in a fridge at the centre, then at the plant which produced that meat, an Enterprise Foods operated facility in Polokwane. 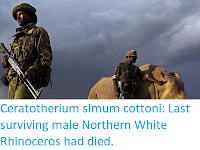 Since this time instances of Listeria (which has an incubation period of up to two months) across South Africa have been linked to the plant, and there is concern that other countries may have been effected, as meat is exported across Southern Africa from the site, though to date only a single case outside South Africa (in Namibia) has been associated with the outbreak. 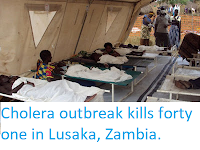 The incident is currently the largest Listeria outbreak ever recorded, according to the World Health Organisation, and it is feared there may have been many more unreported cases, as Listeria only became a notifiable disease (a disease that requires doctors to report cases to the authorities) in South Africa in December 2018. 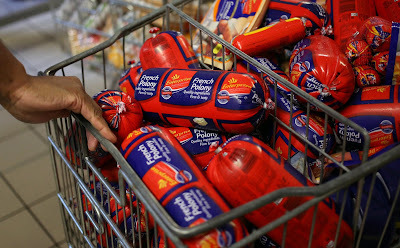 Processed meat products from the Enterprise Foods plant in Polokwane being removed from shop shelves in South Africa following a product recall. Siphiwe Sibeko/Reuters. 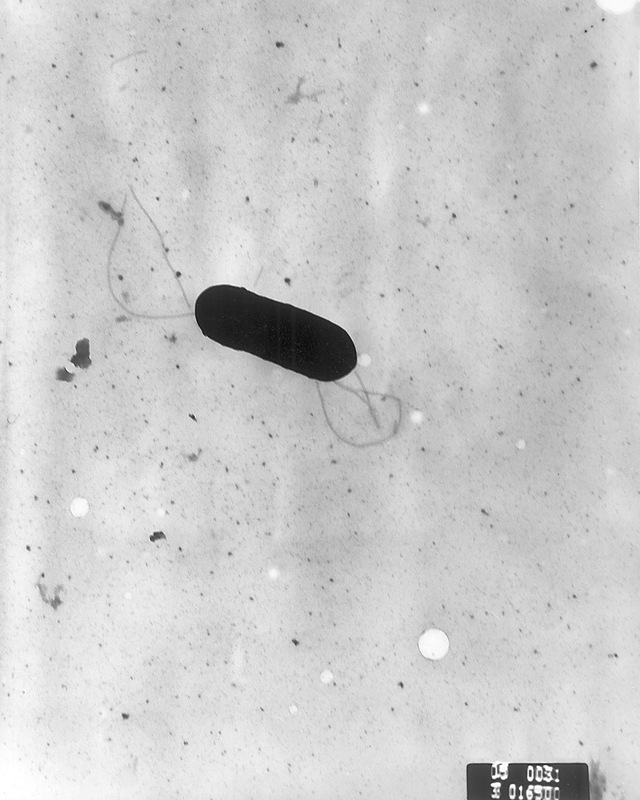 Listeria monocytogenes is a facultative anaerobic Bacterium (Bacterium that does not need oxygen to survive, but which is not poisoned by it either) that is one of the most common causes of food-poisoning in Humans, causing an estimated 1600 infections and 260 fatalities in the US each year. 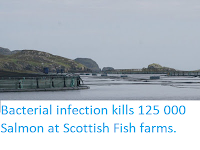 It is a form of Firmicutes, tough cell-walled Bacteria that produce endospores capable of surviving desiccation and other extreme conditions, making the Bacteria very hard to eradicate. Electron micrograph of a flagellated Listeria monocytogenes Bacterium, Magnified 41 250 times. Elizabeth White/Centers for Disease Control and Prevention/Wikipedia. Listeria monocytogenes is particularly associated with unpasteurised dairy products (such as raw milk cheeses), as it is primarily an infection of Ruminant Mammals. 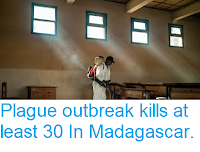 It can cause meningitis-type infections in Humans, and is particularly dangerous to the very old, very young and those with compromised immune systems. 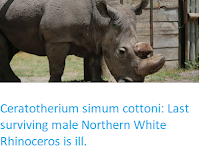 However it can also thrive in Human gastrointestinal tracts without harming the host (it is estimated that about 10% of people are infected) raising the possibility of direst Human-to-Human transmission. Dramatic rifting splits roads and homes in Narok County, Kenya. 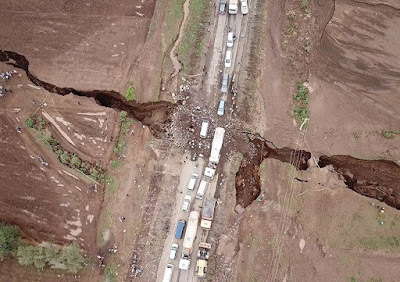 A dramatic rift has opened up in Narok County, Kenya (to the west of Nairobi), splitting the main Mai Mahiu-Narok road in two. 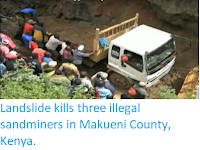 The rift, which is described as being about 15 m wide and 15 m deep, opened up on Monday 26 March 2018, and runs largely through farmland, though as well as splitting the Mai Mahiu-Narok road it is reported to have destroyed a number of homes, although no injuries have been reported following the event. 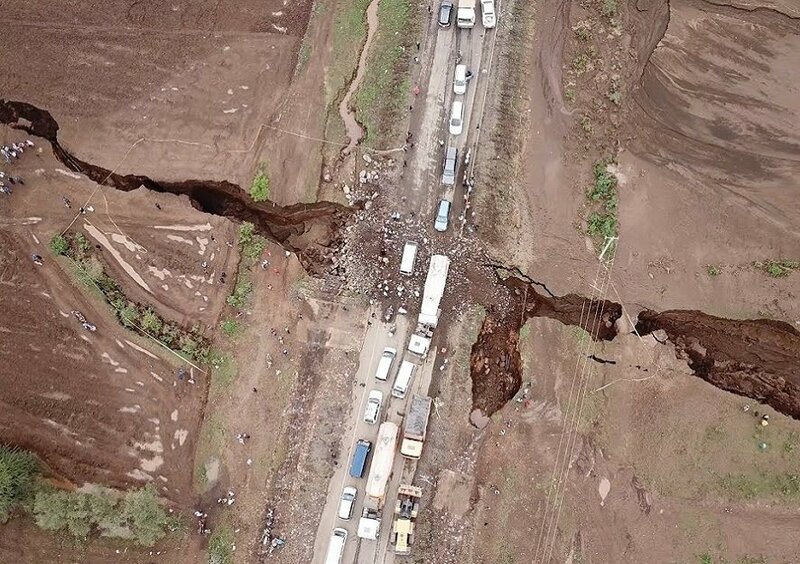 Aerial photograph showing newly formed geological rift splitting the Mai Mahui-Narok road in Narok County, Kenya. Emergency repairs are currently allowing the passage of traffic. Face2Face Africa. 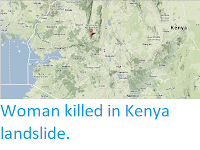 Western Kenya lies within the the of the Great Rift Valley, which is slowly splitting the African Plate in two along a line from the Red Sea through Ethiopia, and which includes the great lakes and volcanoes of east-central Africa. This has the potential to open into a new ocean over the next few tens of millions of years, splitting Africa into two new, smaller, continents; Nubia to the west and Somalia to the east. 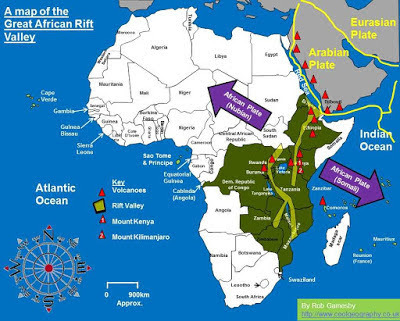 Movement on the African Rift Valley, with associated volcanoes. Rob Gamesby/Cool Geography. 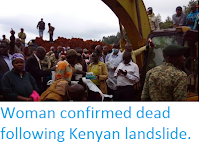 However, this rifting does not usually result in the opening up of dramatic openings at the surface, even in areas like Western Kenya, where the two plates are drawing apart at a rate of about 2.5 cm per year. 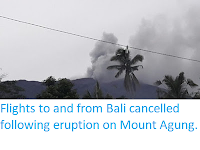 Geologist David Ahede of Rock Link Geological Consultants has suggested that the immediate cause of the rifting is likely to be movement beneath Mount Suswa, a small shield volcano (dome-shaped volcano made up of successive layers of lava) within the Rift Valley. 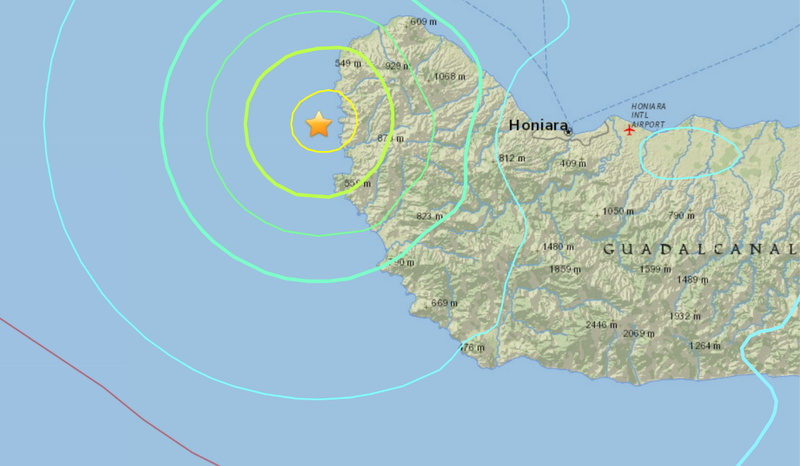 A number of small Earth tremors were recorded near the volcano earlier in the week, which may indicate the movement of magma between chambers beneath the mountain, a possible precursor of future volcanic eruptions. 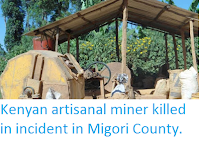 Such movements can place stress on the geology of the surrounding area, causing events like the rift opening observed in Narok County this week. 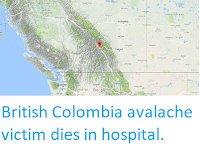 A skier has died in an avalanche in the Whistler and Pemberton area of British Columbia on Wednesday 28 March 2018. 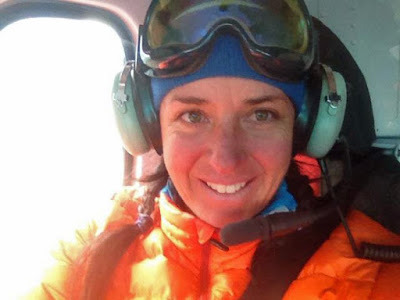 Lisa Korthals, 49, a heli-skiing guide with over 25 years experience was caught in the avalanche near South Creek slightly before 3.00 pm local time. She was still alive when dug out of snow, but died later in hospital despite prompt first aid and prompt transportation to a local hospital. 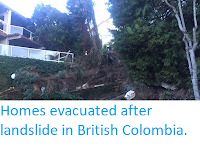 Lisa Korthals, 49, killed in an avalanche in British Columbia on 28 March 2018. 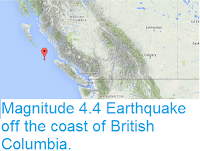 Facebook/Vancouver Courier. Avalanches are caused by the mechanical failure of snowpacks; essentially when the weight of the snow above a certain point exceeds the carrying capacity of the snow at that point to support its weight. 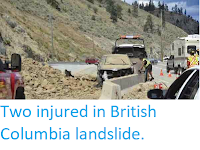 This can happen for two reasons, because more snow falls upslope, causing the weight to rise, or because snow begins to melt downslope, causing the carrying capacity to fall. Avalanches may also be triggered by other events, such as Earthquakes or rockfalls. Contrary to what is often seen in films and on television, avalanches are not usually triggered by loud noises. 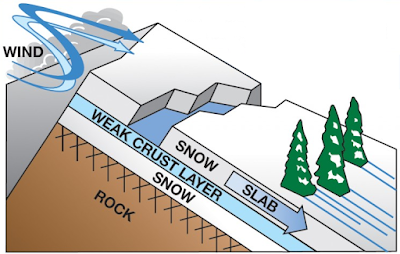 Because snow forms layers, with each layer typically occurring due to a different snowfall, and having different physical properties, multiple avalanches can occur at the same spot, with the failure of a weaker layer losing to the loss of the snow above it, but other layers below left in place - to potentially fail later. Diagrammatic representation of an avalanche, showing how layering of snow contributes to these events. Expedition Earth. Northwestern North America have seen a number of avalanche related incidents this winter, largely due to high levels of snowfall. This is, in turn caused by warmer conditions over the Pacific, which leads to higher rates of evaporation over the ocean, and therefore higher rates of precipitation over North America, which falls as snow in cooler upland regions. There are further concerns that as the climate warms in the coming months, the thawing of this snow will lead to further dangerous avalanches. 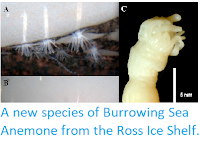 Determining the causes of climate variability in the McMurdo Dry Valleys of Antarctica. The McMurdo Dry Valleys are a largely ice-free region of Antarctica on the Ross Sea coast, discovered by Robert Scott in the early twentieth century. The valleys contain a series of lakes, lacking surface connections and often separated by glaciers. Mean annual air temperature on the valley floor ranges from −14.8 °C to −30.0 °C, and annual precipitation is less than 50 mm water equivalent. Most of the ground in the valleys is frozen, though near-surface groundwater seeps and tracks are present in the upper 70 cm of soil, which are typically extremely saline, enabling them to remain liquid at temperatures below zero degrees centigrade. Despite the apparently inhospitable nature of this area, it is not completely lifeless, with a microbially-dominated ecosystem whose functioning is controlled by available energy from sunlight. 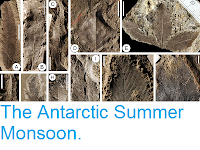 As in other areas, the amount of sunlight reaching the ground in the McMurdo Dry Valleys varies over time, driven by variations in the rotational and orbital cycles of the Earth, variations of the sunspot cycle and the atmospheric optical depth, i.e. the amount of light absorbed or refracted away by water vapour, cloud cover, and other aerosols in the atmosphere. In most areas on Earth, this variability is driven largely by the hydrological cycle, i.e. 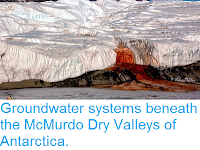 water entering and leaving the atmosphere, but in the cold, dry climate of the McMurdo Dry Valleys this is less likely to be an important factor. 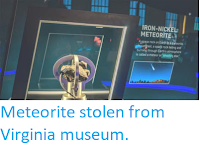 In a paper published in the journal Scientific Reports on 22 March 2018, Maciej Obryk of the Cascades Volcano Observatory of the U.S. Geological Survey, Andrew Fountain of the Department of Geology at Portland State University, Peter Doran of the Department of Geology and Geophysics at Louisiana State University, Berry Lyons of the Byrd Polar Research Center of the Ohio State University, and Ryan Eastman of the Department of Atmospheric Sciences at the University of Washington, publish the results of a survey of solar radiation reaching the ground in the McMurdo Dry Valleys between 1987 and 2015, and speculate about the causes of the variations in this radiation. 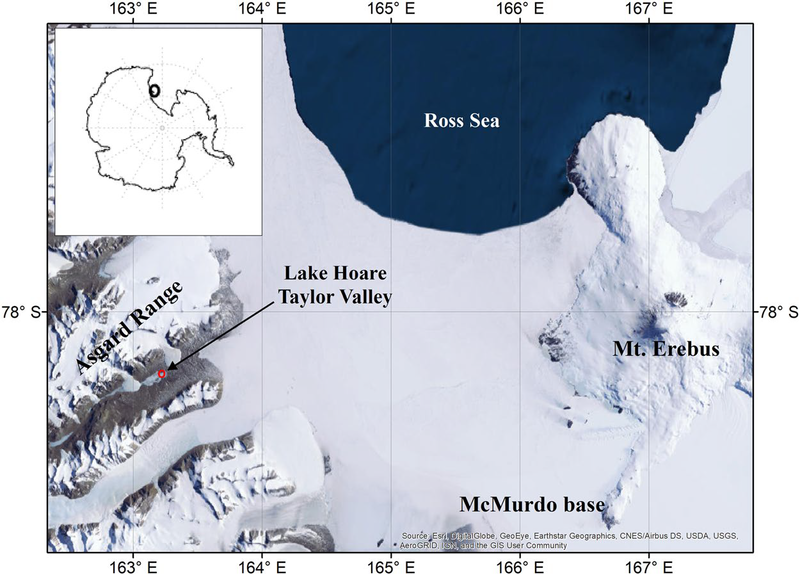 Map of McMurdo Dry Valleys, Antarctica. Lake Hoare Station is located in Taylor Valley. 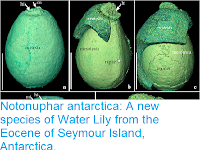 Map generated in ArcGIS 10.1; Antarctica insert generated in Matlab. Obryk et al. (2018). Obryk et al. 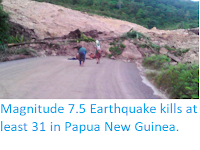 used data from the meteorological station at Lake Hoare in Taylor Valley, which is is located 77.1 m above mean sea level and 15 km inland from the coast. The radiation sensor at Lake Hoare is located three meters above ground and receives direct and diffuse radiation for about 7 months a year. It is the longest running of eight meteorological stations record solar radiation using LiCOR radiometers, chosen for this study because of the length of data available, though where data from the other stations was available it correlated very closely with the Lake Hoare data. In 1987 the Dry Valleys received an average annual shortwave radiation of 78 watt per square metre. This rose slightly from 1987-1990, fell sharply in 1991 then slowly rose to 103 watt per square metre in 2001, then fell again to 86 watt per square metre by 2015. This was compared to the cloud cover records from McMurdo Station (on Ross Island, about 100 km from the study site), excluding low clouds such as nimbostratus, which occur around the Antarctic coast but are not thought to extend as far inland as the McMurdo Dry Valleys (the area is also potentially affected by the Antarctic Ozone Hole, but this allows extra ultra-violet light to reach the ground, wavelengths that were not studied). Next Obryk et al. 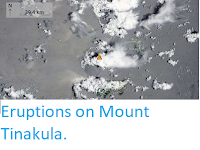 considered the possible impact of emissions from Mount Erebus, a 3794 m volcano on Ross Island, which is continuously degassing, releasing potentially climate effecting sulphur dioxide particles, as well as Human outposts in the area, which produce a small amount to diesel fumes etc. However both of these sources are fairly constant, and even though Mount Erebus did undergo an increase in emission levels between 1984 and 1992, cannot explain the pattern of shortwave radiation variation seen in the Dry Valleys. 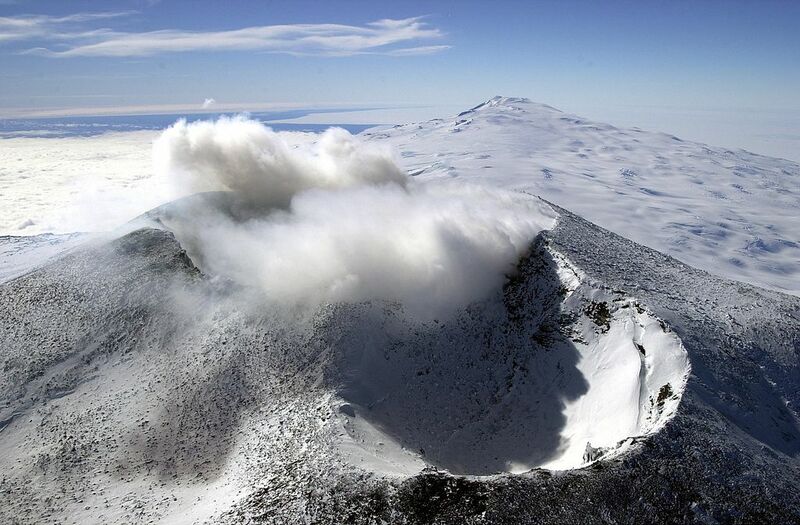 Aerial view of Mount Erebus in December 2000, showing fumarole activity near its craters. Josh Landis/National Science Foundation/United States Antarctic Program/Wikimedia Commons. Next Obryk et al. considered global sources of emissions which might have influenced the climate of the Dry Valleys. 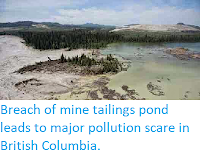 Most such emissions of sulphate aerosols, whether volcanic or Human in origin, only enter the troposphere, which severely restricts their ability to reach the poles, which are protected by low-level currents which tend to keep such emissions at roughly the same latitudes. However emissions which reach the stratosphere can become much more global in distribution, and could have such an influence. Most volcanic eruptions do not influence the stratosphere, but very large eruptions close to the equator can produce material that rises this high. 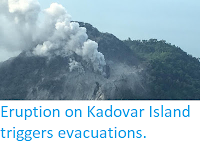 The last two eruptions likely to have achieved this were the El Chichón eruption of 1982, likely to have been two early to have had any influence on the study period, and the Mount Pinatubo eruption of 1991, which may have influenced the low shortwave radiation levels of the early 1990s. The 1990s also saw significant wildfires in the forests of Southeast Asia, Australia and North America, which are also likely to have input significant particulate material into the stratosphere, which may have added to the impact of the Pinatubo eruption, and slowed the recovery afterwards. Air pollution over Southeast Asia in 1997, following a series of forest fires in Indonesia and neighbouring countries, considered to have been the largest forest fires in recorded history. White represents the aerosols (smoke) that remained in the vicinity of the fires. Green, yellow, and red pixels represent increasing amounts of tropospheric ozone (smog) being carried to the west by high-altitude winds. 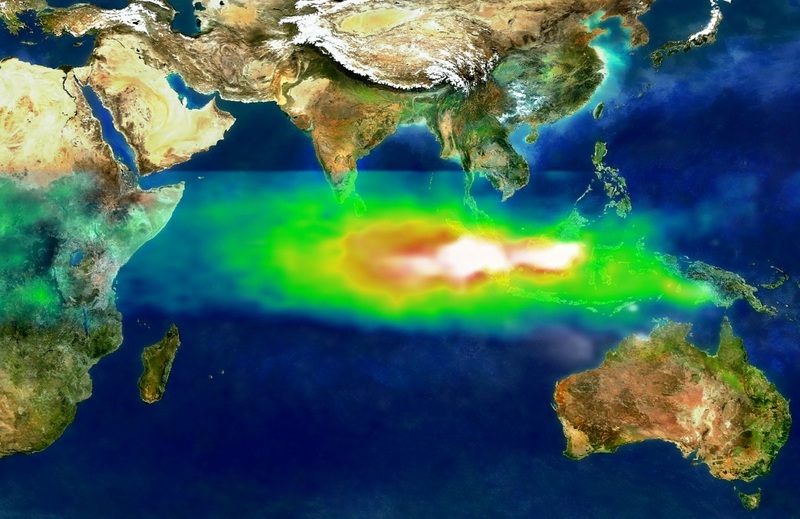 Made using the Total Ozone Mapping Spectrometer system. NASA/Wikimedia Commons. Obryk et al. further note that from the early 2000s onwards there has been a marked increase in anthropogenic sulphur dioxide emissions, combined with a number of smaller volcanic eruptions, which may have contributed to the fall in shortwave radiation reaching the McMurdo Dry Valleys over the later part of the study.